The duo worked with Smith to develop a character that was based off of his thirty years of experience in the business. 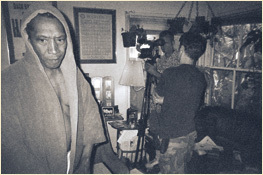 The week long shoot in 2005 transpired into a film about an actor, leaving his last audition, if he doesn’t get the part, he’s leaving and going back to Chicago. The premise, and the way the story came about is very intriguing. It is no doubt a special story that I definitely don’t want to miss. Larry (the Actor) will be screening at the Independent Film Festival of Boston April 25th at 6:30pm, and April 26th at 5:00pm at the Somerville Theater.